A few years ago an acquaintance was browsing at the secondhand bookshop when he made a notable find. It was a copy of a children’s title that he enjoyed as a kid, a Little Golden Book dating back to 1946. The acquaintance, in his early twenties, wasn’t alive when the book became popular. Even though Tootle was the creation of the World War II generation, he still had fond memories; something about it resonated with him. Flipping through the book, he talked about how it told the story of an anthromorphic baby locomotive, Tootle, who wanted to grow up to be a big locomotive. Tootle was an eager student at engine school in the village of Lower Trainswitch, but he had a problem: he liked to wander off the tracks. The acquaintance bought the book, happy to rediscover a childhood treasure. Yesterday evening I came across another copy of Tootle at the secondhand bookshop. I picked it up for three reasons. 1: It was cheap. 2: I’m always been intrigued by how children’s books can mold young minds. 3. My brief exposure years before had bothered me. What was so disturbing? Simple. This concept: Staying on the rails no matter what. Tootle was told that he couldn’t become a big engine – a flyer – unless he scored a 100 A+ in the most important course, Staying on the Rails. But every day when Tootle left town to practice what he was taught, he ended up leaving the tracks to explore the meadow. He would look at flowers and play with butterflies. Tootle felt guilty, despite his enjoyment of his off track playing. Word soon got back to engine school. 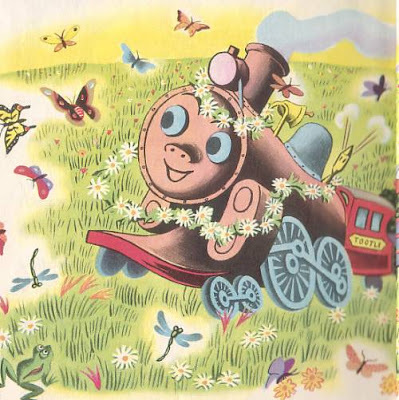 The Mayor of Lower Trainswitch said he saw Tootle playing in the meadow one day with butterflies. And, added the Mayor, Tootle looked very silly. So what could be done to get Tootle back on track? One day the villagers hid throughout the meadow. 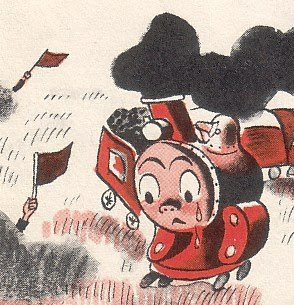 When Tootle didn’t stay on the rails, a villager would stick up a red flag. No engine could disobey a red flag. It meant stop, immediately. Every which way Tootle turned, he was stopped by a red flag. He cried. A green flag waited for him on the rails, telling him that this was the only true path for him. When he finally got back on track, everyone else was happy. And so Tootle was happy. Was Tootle really content deep down inside? In the last scene in the book, the grown-up Tootle is telling young locomotives to Stay on the Rails No Matter What. That question was asked in a classified newspaper ad. A company sought sports minded people for employment. When someone went to the interview, he discovered an insurance company had placed the ad. So what does an interest in sports have to do with selling insurance? Simple. Strike up a conversation with a stranger about the latest big game, win his confidence, and then work your way into a pitch for updating his insurance with a new policy from your company. Are you Stars Wars minded? Submitted for your approval: a little booklet called The True Force, published by the American Tract Society of Garland, Texas. This item was lost in my debris collection until it recently reared its head. Copyrighted 1999, it talks about Star Wars, mentioning that Episode One, The Phantom Menace, has re-ignited interest in the movie series. 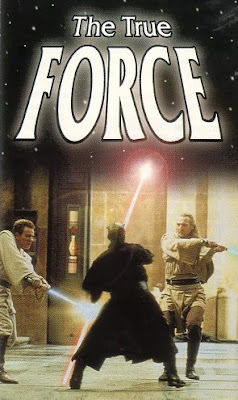 On the cover is a light saber battle scene that does catch the eye, especially the attention of a young kid. I remember how this tract came my way. There was a summer event downtown and a friend’s tweenage daughter was handed a copy. She showed it to her father who eyed it with suspicion. No, he wasn’t upset with SF movies; he enjoyed them. It was the message of the tract that was disturbing. The friend wanted to toss it out but I saved it from the trash bin, adding it to my collection of stuff to be X-rayed later. It’s common knowledge that George Lucas, creator of Star Wars, used religious themes in telling his saga. The Force was his science fictional distillation of all religions. Then there’s a checkbox to indicate that the reader has received Jesus as savior after reading the tract. So the work of George Lucas has been used to lead a young mind to Jesus, albeit one church’s interpretation. Lucas, a self-described Buddhist Methodist, has been quoted that doesn’t view Star Wars as “profoundly religious.” I wonder what he would think about The True Force. To me the tract smacks of Sith mind tricks.